I received recently several request about the ideal Bulgarian mountains hiking routes. 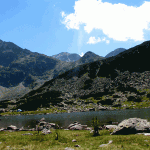 There are two famous mountains in Bulgaria – Rila and Pirin Mountains. There are several more but these two are must to see. Option B: make a bigger hiking tour and stay overnight in a hut in the mountain (this will be the subject of my next post). It’s a nice winter resort. Here you can choose a hotel. My favorite one is Flora (clean, central location, good price).There are is a cable car (running in summer as well, except Mondays and Tuesdays) which will bring you near the highest peak in the country – Musala(2925 m). From the top station, it’s a 3-hour walk to the peak, along a scenic route. Make sure you pack water and some food. If you get early in the morning you will manage to reach the peak and come back to the cable car on time.Borovest is situated near Sofia – about an hour drive and there are regular buses as well. I strongly recommend to rent a car for your stay in Bulgaria. There is a hotel in the mountain next to the lakes, full in the season especially because of the Douno gatherings in the summer time. I recommend to stay in the small resort with termal waters about half an hour drive away. From there you have to drive to Panitchishte mountain resort, there is a small cable car. From last station of the cable car starts nice tour from lake to lake so you can touch some of the lakes and see all of them. 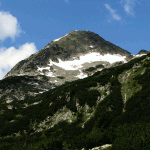 Pirin mountain: perhaps you’ve heard about Bansko – winter ski resort. There is an amazing choice of hotels there – from five star luxury to rooms in some of the authentic medieval houses. My recommendation is for Lucky Bansko (great SPA and service). If you prefer a smaller hotel where the host will prepare your breakfast – Chicho Tsane is the best choice. There is a cable car from Bansko to the mountain and where a lot of hiking tours starts. With a car you can reach Vihren hut and from there is a tough hiking route to the Vihren peak (2914 m – the second highest peak in Bulgaria). You can manage it for a day, take plenty of water with you, because you will not find any water on the way up (besides some small lakes). There are other nice tours there so you can stay there 2-3 days at least. Near Bansko is situated another small ski resort Dobrinishte – there are termal springs / Roman baths as well. There’s a cable car to the mountain where you can find some good hiking routes. This entry was posted in Hiking in BG on July 10, 2013 by ralu.